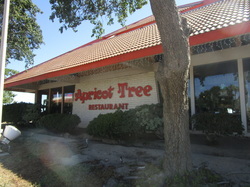 The Apricot Tree in Firebaugh, Ca offers a break from the usual fast food fare that travelers usually eat. The service is exceptionally friendly and fast, so don’t let the laid back atmosphere fool you. For breakfast, the restaurant menu features apricots and pancakes, apricots and French toast, apricot muffins and other apricot themed items. No one has to order apricots though. The pancakes are as big as the plates. The restaurant has its own orchard, but because of the drought, it has had to source some of its apricots from the San Francisco area. The Apricot Tree is decorated with hundreds of old lunch boxes representing childhood from the 1950s through the 1990s and possibly later. Lunch box thermoses are kept in a divider between seats. The whimsical decorations bring back fond memories of music, television and Saturday morning cartoons. So take a seat, have a good meal and continue your trip full and happy.